To call algorithms and interact with the Data API, you’ll use an API key to authenticate. 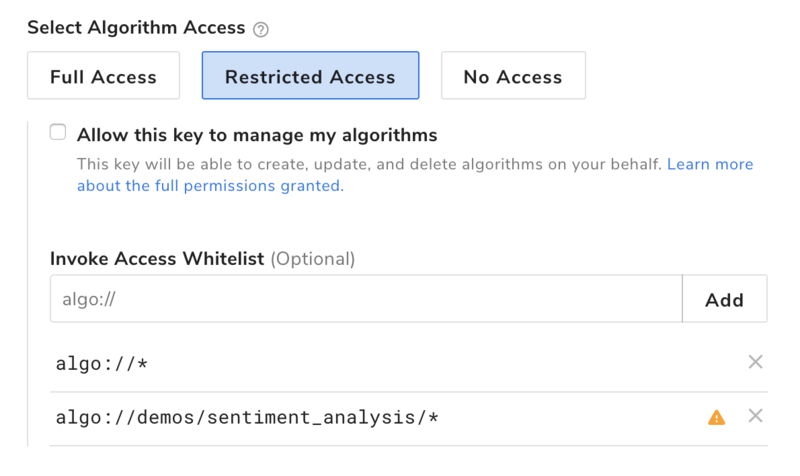 But did you know you can create additional API keys and customize their access permissions? This guide will show you how. 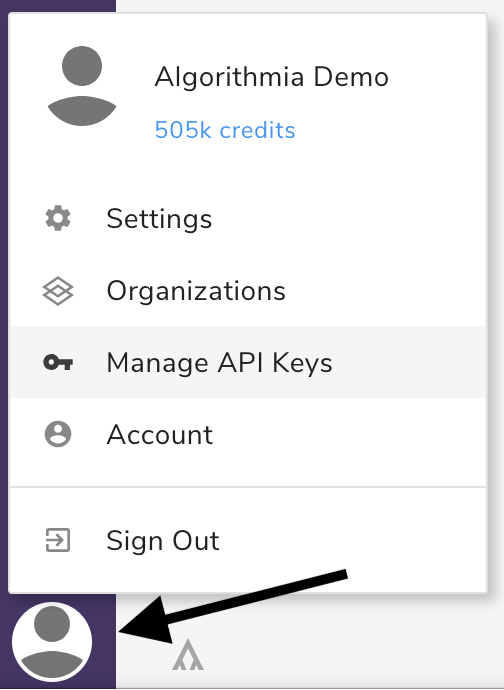 To view your API keys, head on over to your profile on Algorithmia and click on the “My API Keys” option in the menu. For more information about your profile, be sure to check out the Your Profile guide for more information. When you sign up for Algorithmia, your account is created with a default API key. Conveniently, it is named default-key! This key will show up in the code snippets on an algorithm profile page when you are signed in, allowing you to easily make calls to the algorithm either through the web console or by copying the code directly to include in your program. If you delete your default-key, it will no longer show up in the code snippets on the algorithm profile pages. Simply create a new key and name it default-key to have it appear again! Each API key can be customized to enable or restrict access depending on your needs. This is particularly helpful if you are running multiple applications or websites that use the Algorithmia API. Each app can use a different key so that if they are ever compromised (such as accidentally pushing a key to GitHub), you won’t have to reset the API key for each project. This allows you to put security first by enabling the access you need. 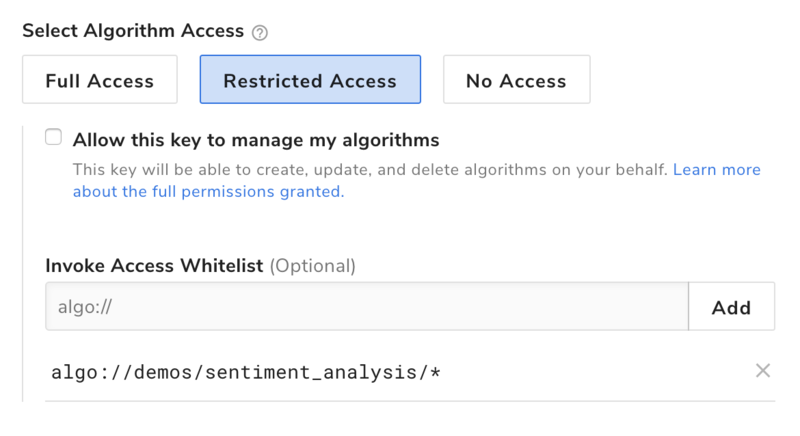 One way you can restrict access with an API key is to only white list the algorithms that you want that key to be able to call. Note that algo:// is the prefix you’ll need to use before the owner name and algorithm name. Let’s say that I have a project that has its own API key that I want to restrict to only call the algorithms I specify. I’ll name my key after the project, then add the algorithms it can call. If I want to use SiteMap, I’ll format the alias like this: algo:// + the algorithm owner + the algorithm name. Thus Generate Paragraph from Trigram would end ups as algo://web/SiteMap (where in this case the username is web). By default, any key can call any algorithm on the platform. You can see in the above screenshot that under the Algorithm Access section, there is an entry algo://*, which is highlighted. This is a wildcard that matches all of the algorithms. To make sure your key is restricted to calling only the algorithms you’ve specified above, be sure to remove this wildcard entry by clicking on the trashcan icon. As you can see, when you allow cross-origin requests to use your authentication, you can restrict the access by referrer hostname. This is a security measure that allows you to say that the API key can only be used when the request is coming from your website. The third method to customize your API key access is to change its permissions relating to the Data API. By default, when you create a new API key data access is set to none. You have two options to change the Data API access: you can either let your API key have permission to read only or to allow read and write access. By selecting read only, you’ve set up your API key permissions to let it access data in through the API but not write to your data. This is good if you have an application that needs to be able to read a trained model or data file that you’ve stored in order to run the algorithm but won’t be saving any data from the API call. When you select read and write, the API key has the ability to both read from your data as well as write to it. For many algorithms, the results can be written to your storage through the Data API and the API key making the call will need the permissions to write. If you are trying to run an algorithm that writes to your data storage but are getting an authentication error, make sure that the API key you are using to authenticate has all the necessary permissions you need.